Newcastle Falcons scored five tries on their way to thumping Sale Sharks 39-12 at Kingston Park in the Anglo Welsh LV=Cup on Sunday. Newcastle were comfortable winners at home to fellow Premiership side Sale on Sunday, running in five tries at Kingston Park. 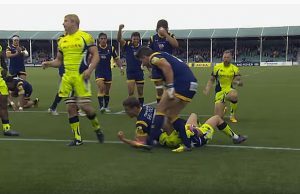 Sale were hindered by three yellow cards in the first 44 minutes, at one point going down to 13 men, meaning they never got close to challenging the Falcons lead. 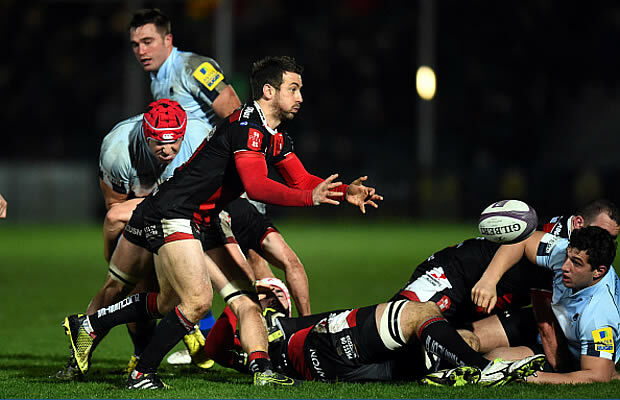 League convert Lee Smith scored two tries as Newcastle kept their hopes of making the semi-finals alive. Scott MacLeod was named man of the match. Newcastle Falcons: 15 Alex Tait, 14 Lee Smith, 13 Jamie Helleur, 12 Anitelea Tuilagi, 11 Danny Barnes, 10 Rory Clegg, 9 Ruki Tipuna, 8 Uili Kolo’ofai, 7 Andy Saull (c), 6 Richard Mayhew, 5 Scott MacLeod, 4 Josh Furno, 3 Alex Rogers, 2 Rob Hawkins, 1 Eric Fry. Replacements: 16 Scott Lawson, 17 Rob Vickers, 18 Mark Irving, 19 Sean Robinson, 20 Ally Hogg, 21 Mike Blair, 22 Phil Godman, 23 Simon Hammersley. 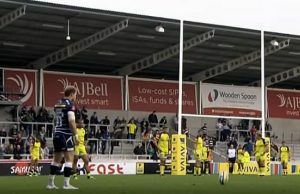 Sale Sharks: 15 Luke McLean, 14 Tom Brady, 13 Andy Forsyth, 12 Sam Bedlow, 11 Phil Mackenzie, 10 Joe Ford, 9 Nathan Fowles, 8 Viliami Fihaki, 7 TJ Ioane, 6 Mark Easter, 5 George Nott, 4 Andrei Ostrikov, 3 Ciaran Parker, 2 Tommy Taylor, 1 Alberto de Marchi. Replacements: 16 Shalva Mamukashvili, 17 Maxim Cobilas, 18 James Flynn, 19 Nathan Hines, 20 Andy Hughes, 21 Will Cliff, 22 Nick Macleod, 23 Sam James.